Milestone achieved for Parnell Square Cultural Quarter as planning application finalised. Detailed plans for Parnell Square Cultural Quarter, which will be anchored by a new City Library, were presented in City Hall, today, Monday 10 September. The design team, led by Grafton Architects and Shaffrey Architects, is currently finalising the planning application which will be lodged with An Bord Pleanala for consideration in the coming weeks. The project to deliver a new cultural landmark for Dublin is being undertaken by Parnell Square Foundation, a charitable trust established by Kennedy Wilson with the support of Dublin City Council. The Foundation has been set up to raise funds and finance the project which is being developed by its wholly owned subsidiary company PSQ Developments Limited. A funding model has been agreed which will see a minimum of 55% of the project funded by philanthropy. Dublin City Council will fund a maximum of 45% of the project cost. 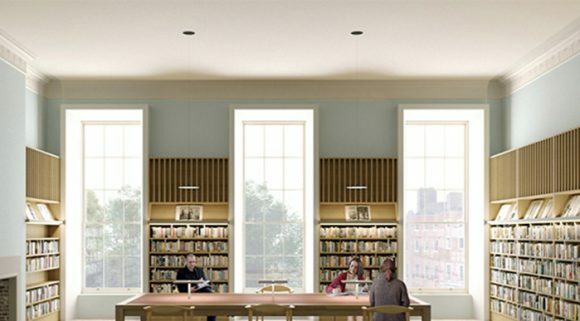 This major 11,000 square metre project will see a new City Library and a variety of cultural uses located in a terrace of six restored Georgian houses at 23-28 Parnell Square and a dramatic new building to be constructed to the rear. As part of the overall plan, the Georgian houses at No 20 and No 21 Parnell Square will also be redeveloped and a new public plaza created in front of the City Library buildings and Dublin City Gallery The Hugh Lane. See design images in our Gallery. The new City Library, which will replace and reimagine the current Central Library, will create an exciting new destination for learning, literature, information and culture. Located beside Dublin City Gallery The Hugh Lane and very close to the Irish Writers’ Centre, the Dublin Writers Museum, the Gate Theatre, Poetry Ireland and the Garden of Remembrance, it is envisaged that the Library will create a focal point for Parnell Square Cultural Quarter. As part of the Parnell Square Cultural Quarter, the Library, in addition to developing a contemporary library space will also have a range of cultural facilities, including a music centre, a design space, an innovation hub and business library, a conference space, an education centre, a café and exhibition areas. Speaking at the launch of the plans, City Architect Ali Grehan said that the project was designed to make the Parnell Square Cultural Quarter a landmark destination that will revitalise Dublin’s historic Civic Spine. “The Public Library and Cultural Quarter will be a magnificent synthesis of historic and contemporary architecture unique to Dublin, drawing people along the pivotal route that connects Christchurch and Dublin Castle, through College Green and O’Connell Street, to Parnell Square,” she said. 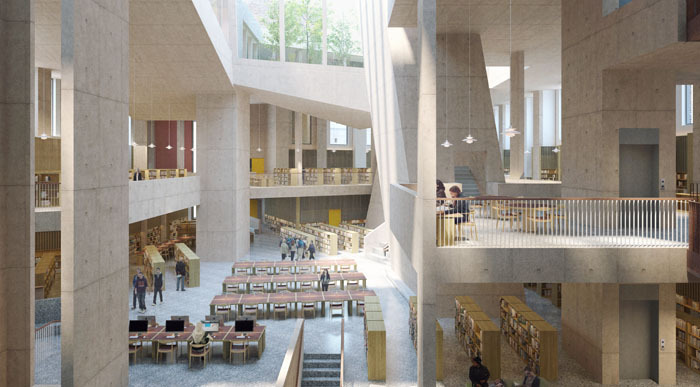 Subject to planning permission, and the procurement of contractors, it is anticipated that the construction and commissioning stage of the new City Library project will take two to three years. The full cost of the project to date has been funded by the Foundation through a donation by Kennedy Wilson and following lodging of planning, Kennedy Wilson will support the Foundation on the remaining philanthropic fund-raising programme. Watch a short video to mark the milestone achieved for Parnell Square Cultural Quarter, as the planning application is finalised.